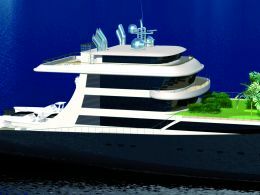 A 99 metre super yacht which looks like a merchant ship is the outcome, of Wally Design's creativity and genius in conjunction with architect Mauro Sculli. It is a particular project structured on a savings concept which allows to cut costs down to the equivalent of building a 60 metre yacht. 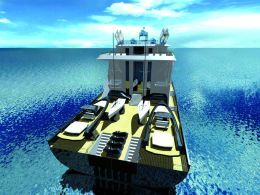 The motor yacht's design developed in length as opposed to height produces greater stability at sea and lends itself to ample solutions for the over 1.000 sq. metres to be found at the bows such as the making of a tennis court, a mini football field or a large garden with pool. The turret astern of the yacht's centre line, designed in the likings of an airport's control tower withholds three decks. The centre one, comprising an office, a large saloon and a stateroom with two en- suites, a king size bed and a walk in wardrobe, is entirely for the owner. The deck above caters for the wheelhouse furnished with two large sofas and a service bathroom plus two cabins with bathroom for the captain and first officer. The lower deck of the turret hosts a central dining room with two lateral areas to relax in. These decks are accessed by two stairways respectively for the guests and crew or by two lifts for the separate use of guests and crew. Inside the vessel there are three other decks the lowest one is for the engine room, fuel tanks and technical systems. The "Service & Saloon deck" is for the galley and its store room, freezers, laundry room, the 40 crew members' dining area and their twenty cabins, a ball room, library and cinema. The main deck is reserved for the guests' quarters formed by six "vip" cabins with two en-suites each and a sofa which may be turned into another double bed. 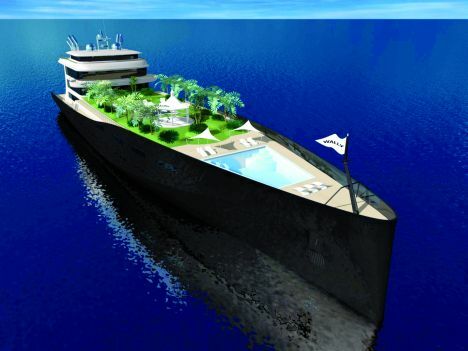 On this same deck there is also an enormous saloon and fitness centre with sauna, massage room, showers and a gym. The Wally Island offers a choice of solutions for "short" hops that range from two 47' Wally Power boats, watercrafts, two sailing boats and two cars. For further information please contact: Wally, 8 Av. Des Ligures, MC 98000, Principality of Monaco. Tel: +377 93100093. Fax: +377 93100094. Web page: www.wally.com.